June 1 - July 1, 2018. Opening reception: June 1st 7-10pm. AM Gallery is pleased to present the work of Zach Friedline, a longtime member of the ArtMovement family. Through his work, Friedline investigates the alluring quality of American consumer culture and its ability to manufacture happiness. Since marketing, or, more specifically, the strategic wrapping of merchandise in branded content, engenders a culture of identity around an object like Nike sneakers, the very packaging takes on a social value which the artist has termed “multicolored gold”—a titular nod to Donald Judd’s multicolored works, which speak to Friedline through their rich colors and emphasis on finish fetish. 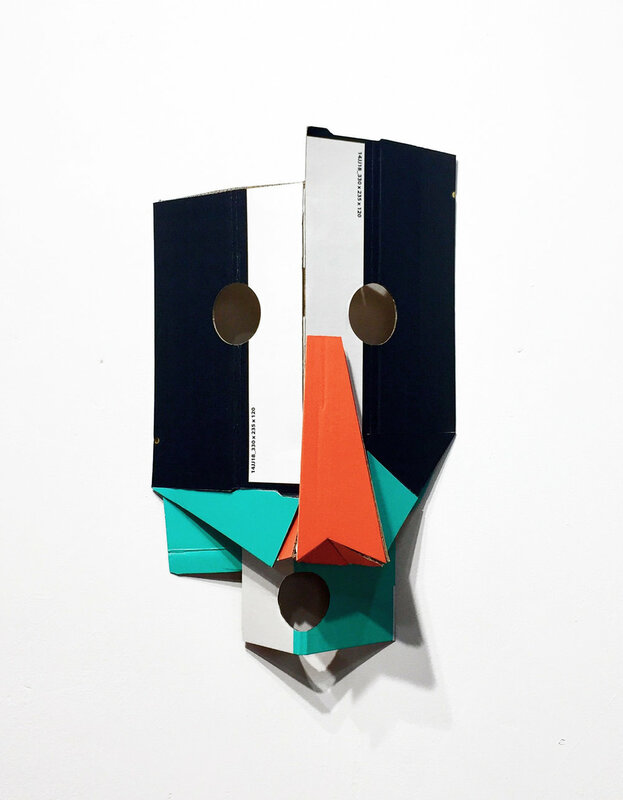 Nike shoe boxes thus serve as Friedline’s primary medium, which he uses to create color-blocked wall panels and three-dimensional cubistic masks, inspired by those of Picasso. Both forms serve as a sort of cultural currency, ascribing value and character to the individual who possesses them. Because of Nike’s dual relationship to personal and group identity, it can simultaneously be framed as both elitist and ordinary. As such, Friedline’s work meditates on this dichotomy and reflects an individual’s decision to either fit in or stand out within their community. Zach Friedline lives and works in lnglewood, CA, with his wife and son.